Winter grooming has begun on Summit County recpaths. 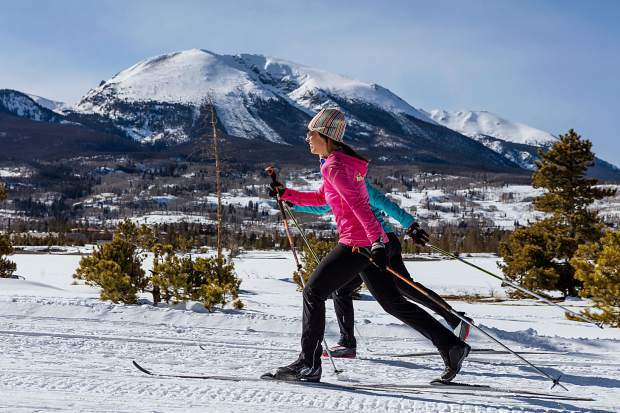 Cross-country skiers can now ski between Frisco and Breckenridge. Summit County, the U.S. Forest Service and the towns of Breckenridge and Frisco have partnered to groom the Summit County Recreational Pathway System between Frisco and Breckenridge, a new service that will enhance opportunities for winter recreation. Allowed winter uses on the Recpath include cross-country skiing, bicycling, walking, snowshoeing and other non-motorized recreation. Recpath grooming began in February of this year, and will continue during winter from here on out. The groomed section of the Recpath now extends from the new Dickey Day Use parking area at the top of the Frisco Adventure Park to Valley Brook Road in Breckenridge. The grooming now connects the Gold Run Nordic Center to Frisco Nordic Center, as well as another direct connection between Frisco and Breckenridge in the winter. The grooming services also increase winter trail access to and from Summit High School and several residential neighborhoods along the route. Grooming will continue through April as long as there is sufficient snow to prevent impacts to the pathway and surrounding natural areas. Users are encouraged to be respectful and courteous to one another on the multiuse pathway and to use proper trail etiquette, including packing out all trash. Just as in the summer, dogs are required to be leashed when on the pathway, and motorized uses are not allowed. Pet owners are required by law to pick up pet waste and dispose of it properly in a trash receptacle.